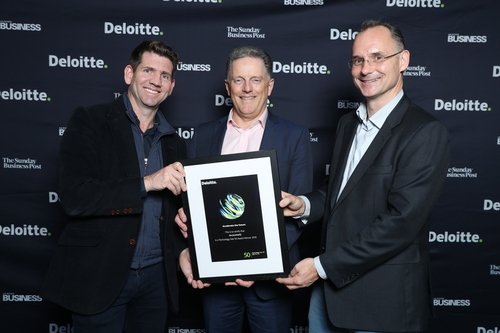 Dublin, 8th November 2018 — AccountsIQ, the Cloud based Financial Management software company, ranked 21 in the 2018 Deloitte Technology Fast 50, a ranking of the 50 fastest growing technology companies in Ireland. Rankings are based on average percentage revenue growth over four years and AccountsIQ have now ranked in the Fast 50 for the fourth consecutive year. Connolly continues, “We are in such good company in the Fast 50, with dynamic growing companies like Spearline Labs, SilverCloud Health and XSellco who took the top spot this year, all using AccountsIQ. These high-growth tech companies are great examples of the sort of clients adopting AccountsIQ, who need the functionality, sophistication and scalability to handle the rapid growth they are experiencing. AccountsIQ has always enjoyed a unique position in the technology sector as being a great fit for fast-growing businesses, particularly as they expand internationally." “We plan to capitalise on the trend towards cloud solutions and have significant growth plans for 2019. We are investing in expanding our team in all areas. We feel passionately that delighting customers helps underpin growth and therefore customer success is a key focus of this investment. Our recent accolade of being awarded the UK's Enterprise Accounting Software of the Year 2018, beating big brands like Sage, SAP and Exact, was mainly due to user voting, so customer satisfaction is core to our values and will continue to be a central theme as we grow”. Its unique way of producing consolidation reports in real time makes AccountsIQ an obvious choice for multi-entity businesses. AccountsIQ’s ability to integrate with other applications allows customers to join up processes and information business-wide and replaces legacy accounting software.